From the time of Marco Polo’s first journey to the Orient, Europeans have been fascinated with Asia — its strange customs, its alluring women, its spices and jewels and colors, its markets where everything could be had for a price, its vast expanse traversed by caravansaries buying or selling silk, its fearsome warriors, the persistence of its pre-Christian animist religions — the list is endless. One could explore Asia for a lifetime, and many have done just that. Missionaries were among the first, followed by traders, explorers, and the advance guard of European sovereigns seeking to extend their political domains. The British and Dutch East India Companies sought the riches of the Orient, one of the products of this search being the lure of the exotic. As imperial colonies were established, legions of outcasts found a second home in Asia which over time became their first home. Such were the younger sons of the British elite who became colonial administrators, populating the stories of Maugham and Kipling, with their easy acceptance of Asian ways shocking their metropolitan cousins, who wrote them off as having ‘gone native’. The quaintness of the phrase reveals its irrelevance today. The Victorian / Meiji period (mid- to late-19th century and early 20th-century) saw an influx of Western visitors different from their antecedents. They were, in a way, missionaries in reverse. Soon after the forcible ending of Japan’s isolation in 1853, there arrived in Japan a cohort of visitors less interested in bringing Christianity than in seeking enlightenment via Oriental Wisdom. These prominent Bostonians comprised literati (Ernest Fenollosa), archaeologist-collectors (Edward Morse), connoisseur-collectors (Sturgis Bigelow), historians (Henry Adams), artists (John La Farge), explorers (Percival Lowell), enlightenment-seekers, curiosity-seekers, and afficianados of the exotic (the erstwhile low-life Lafcadio Hearn, who rose from nowhere to become an honored sensei in Japan). Their pioneering role is described in Christopher Benfey’s excellent Great Wave book. They forged the template for all who later found their way to Japan and Asia. Even before reaching Japan’s shores, their fertile imaginations conjured a semi-mythological Japan. The modern Western enchantment with Japan then embellished the Japanese home-grown myths of national identity. The Bostonians’ dissatisfaction with the post-Civil War money-grubbing America of their day supplied the negative image from which their positive notions of the Orient were fashioned. It was no coincidence that New England-style transcendentalism, restraint, and nature-worship were attributed to the Japanese. To these admirable qualities others were added: alluring women, exquisite craftsmanship, disciplined warriors, oracular brevity, charming village life, respect for tradition, and quiet savoir-faire. Upon arrival, the visitors sought out artifacts corresponding to their notions of the Orient, thus launching the lively export trade that grew up to satisfy this demand. The Mysterious East, especially Japan, was only too happy to oblige, making itself into a major exporter of exotic cultural artifacts. Once the Japanese learned what was expected, they lost no time in producing it. To the Oriental tendency of providing whatever it was that was sought-after, was added, especially after the ‘Black Ships’ had arrived in 1853, the necessity of cultivating friendly relations with would-be Western imperialists until Japan might be better able to defend itself. From the mid-19th-century onward, Japan produced a prodigious number of woodblock prints for export. These pictures of courtesans, simple country-folk tilling idyllic golden fields of rice set in green landscapes, rural villages, ghoulish monsters, dragons, animated seascapes, colorful temples and shrines, and numerous other exotica catered to the Western desire for contact with exotic Japan. The land conjured by these images was neither wholly imaginary nor quite real: Fantasies, like dreams, must have some basis in fact to carry conviction. These woodblock prints poured out of Japan unceasingly, finding their way into every museum in Europe and America. For many public and private collectors, ‘Japanese art’ means woodblock prints, as if nothing else existed. Ukiyo-e today retain much of their original fascination, as waves of Japonisme sweep over the lands to which they were first exported. The simplicity and novel perspectives of these charming prints influenced Monet, Cezanne, Whistler, Frank Lloyd Wright, and many others. Where the West was driven by the cult of efficiency and machinery, Japan in their view revered wabi/sabi and the softer virtues. Their favorite sensei, Okakura Kakuzo, hit upon the idea of using the Bostonians’ love of tea to popularize cha-no-yu. It, and he, worked their charms largely on women like Isabella Stewart Gardner (of Museum fame), in whose polite society he cut a broad swath. The narrative of the Mysterious East survived every disappointment that the facts on the ground could throw at it. The rigors of travel in Meiji Japan, dodging cholera epidemics, typhoons, foul-smelling agricultural fields, noisy bathers at an inn, and excessively elaborate etiquette, tried Henry Adams’ patience no end, yet did not discourage his artist-friend John LaFarge from training his eye on charming village scenes. As Japan’s intense drive to modernize gathered momentum, though, even affcianados of traditional Japanese virtues found it hard to direct their gaze exclusively on the past. Around the turn of the 20th-century, they realized their time was up — they could neither live with nor deny what they saw as Japan’s ruin. Yet the narrative survived Japan’s industrialization, militarization, and even the deadly conflict of World War II. As much as tea parties and flower-arranging appealed to those favoring the yin virtues, the complementary yang virtues of adventure attracted others. No less a Rough Rider than Teddy Roosevelt practiced Oriental martial arts (spurred on by Sturgis Bigelow). The ‘Great Game‘ in Central Asia attracted those who were anxious to test their mettle against some of the most inhospitable terrain on the planet — the barren unexplored Himalayan plateau and mountain passes. Explorers and soldiers-of-fortune dressed in native garb mapped these seemingly impenetrable regions, paving the way for the hardly more regular troops to follow. For a century they fought native tribes and each other for King and Country, or Czar and Country – for this was a contest between Britain and Russia, two empires which the emirs and khans did their best to play off against one another, knowing this was the only way the latter could keep their independence. The great prize of the ‘Great Game’ was India, the pearl of the Orient, and the brightest star in Queen Victoria’s crown. With every advance of the Czar’s forces toward Herat, the Khyber Pass, Gilgit, Chitral, or the unnamed route through the Pamirs, London and Calcutta trembled, yet held the high ground until it was time for India itself to become independent. The ‘Great Game’ is still being played out in Central Asia today, under a different guise, with America inheriting the British role, and local tribes still jockeying for position by playing the imperial powers off against each other. Through the enormously varied cultural interchanges wrought by trade, war, migration, and travel; from sleek consumer electronics and fashion models, to manga, cuisine, and minimalist architecture, Asian influences now permeate the lives of Westerners without their ever leaving home. With the declining salience of antiquarian purity in Asian art, and the inability of contemporary Western models to fill the gap, the ‘mysterious East’ will likely re-invent itself again, in the hands of those artists and viewers for whom Asian traditions are second nature. 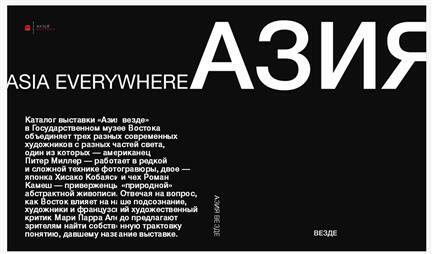 This essay is published in the exhibition catalog for the Asia Everywhere exhibit held at the National Museum of Oriental Art in Moscow, Russia in September 2015. The catalog is available from the Oriental Museum, 12a Nikitsky Blvd, Moscow 119019; tel: +7-495-691-0341. ISBN 978-5-903417-64-3. This entry was posted on 10/05/2015 (Sunday) at 11:47 am and is filed under Appreciations, Cultural commons. You can follow any responses to this entry through the RSS 2.0 feed. Both comments and pings are currently closed. R755 theme designed by varometro. 59 queries in 1.694 seconds.